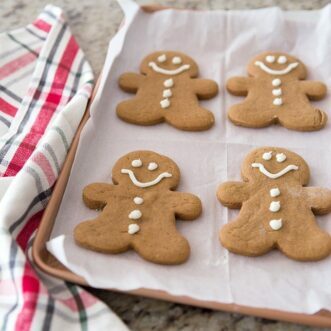 The perfect recipe for soft and delicious gingerbread cookies. With a mixer, beat shortening on high speed for 30 seconds or until light and fluffy. Add sugar, spices, baking powder and baking soda and mix until combined, scraping the sides of the bowl as needed. Mix in egg. Mix in molasses and vinegar, again scraping the bowl until evenly combined. Add flour until evenly combined. Wrap dough in parchment and refrigerate for 3 hours. I like to make it more flat and rectangular instead of a round ball. This makes it chill more quickly and evenly. Roll out dough on floured surface, 1/2 at a time, to be a little thicker than 1/4 inch. Use cookie cutters to cut dough into shapes. Bake for 5-6 minutes or until tops of cookies are barely dry. Adapted from the Better Homes and Gardens Cookbook.